We wish to advise that your 5-year registration as Homemaker is about to expire. In order to renew your registration, you are required to demonstrate a commitment to your continuing professional development. Please find enclosed the compulsory text Better Home Making*. Core studies for this term are Stain Removal, Invalid Cookery, Harmonious Lighting and Lovely Legs. Due to several complaints received by the board, you are also required to complete Grace And Charm. In addition we would encourage you to undertake an elective from Hang Your Own Wallpaper, Mend A Fuse or Home Manicure. We trust these studies will be as fulfilling as the joyous practical work in which you are engaged. * My copy of "Better Home Making" c.1950, was an excellent thrift shop find. I'll make sure I share some of its advice with you some time soon! Oh dear, I actually thought that was a picture of Hannibal Lecter! I thought the same as curly pops! Wearing that mask would make any self respecting hubby run for the hills - or maybe if you wore it at dinner time he wouldn't dare ask what was on the menu! You are brilliant you know that don't you? 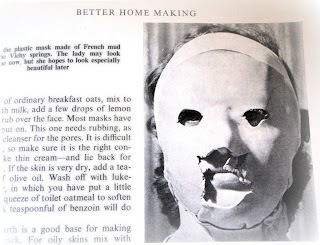 I like the text that says "she hopes to look especially beautiful later". The high school drawings are wonderful! LOL I too am with Curly Pops....I love the invalid cooking section of my old CWA cookbooks LOL. Hee hee, that mask is freaky, I too thought it was from some classic horror flick. The things we do for beauty.